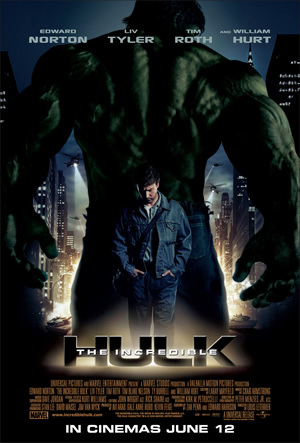 Without a doubt there will be comparisons for the initiated and for the uninitiated, the thought that The Incredible Hulk (2008) is a sequel to Hulk (2003). With the starting of Marvel Studios, this edition of Hulk is most probably to do justice to the green giant. Marvel Studios has come out stating that Ang Lee’s Hulk was one that was more poetic and had little action and wanted to do one that was the opposite. The Incredible Hulk spends little time introducing the audience to the characters and their back story. It does however, give the audience of quick glimpse of a pre-story during its opening credits ala Spider-man 2. This decision was made as explained by Edward Norton who doubles up as Bruce Banner and Executive Producer on this film, “I don't think that in great literature/films explaining the story's roots means it comes in the beginning. Audiences know the story, so we're dealing with it artfully." Right. And so, right after the opening credits, the story takes us to Brazil where Bruce Banner has been hiding from the US Army. He has been living a mostly quiet life for many months, completely missing from the Army’s radar. That is until, he gets involved in a freak accident at a bottle factory and soon enough, the Army swoops in on him and all hell breaks lose in the samba city. Banner somehow returns to the US of A and all hell breaks loose again when he is discovered again and General Ross calls for a little war of his own against Banner. Serums and cures are tossed around a lot and Hulk finds himself a villain in the form of the Abomination, Royal Marine Emil Blonsky pre-transformation. A lyrical piece or a wham-bam-thank-you-ma’am movie? You tell me. Actor’s actor, Edward Norton as Bruce Banner is not at his best here but he does a good enough job. Liv Tyler as Betty Ross was as 2D as 2D could get. I pity any actress who plays the Betty Ross character actually. Here lies a character that has to deal with what is possibly the worst thing ever that could happen to one’s lover and yet not get that much of a chance to shine. William Hurt gives the General Ross role a bit more evil than Sam Elliott could. He played it with just the right amount of muted menace and heartless sonofagun. Both he and Jeff Bridges have taken up pretty interesting roles in the two Marvel movies this summer. Tim Roth on the other hand, seemed a bit out of place as the villain and should really stick to character films. Do keep a lookout when his Emil Blonsky has a bone crushing showdown with Hulk. Despite the near two hour runtime, the movie crusades very quickly, not to good effect and at times, the plot feels a bit too scattered. This movie might have been a labour of love to set things right but that could have also been its downfall where trying to cram everything together turns out to be the wrong choice. Louis Letterier, whose claim to fame includes Unleashed and Transporter 2 did an okay job for all his B-grade experiences. Had this movie been in the hands of a better director, it could have been on par with Iron Man. There are saving graces to the film too though. The cameos by Stan Lee and Lou Ferrigno will be a delight for fans as will the cameo by a certain Marvel character at the end of the movie! It was also great fun to watch the monster-a-monster slugfest between Hulk and Abomination on the streets! And of course, Hulk himself was the best deal of the movie. This Hulk is less awkward and does not actually fly, much scarier and angrier. This somewhat scattered review is probably what best sums up The Incredible Hulk. It has a general idea of things and perspective from time to time but otherwise, it is a jolly green mess.